Sunday players and biting your opponents, what else can we expect from this World Cup in Brazil? I had heard of Sunday drivers but not until today I had never heard of Sunday players. I was talking to someone about the World Cup and how some players while performing for their club, never seem to be at the same level for their country. He refers to these players as “Sunday players”. I was intrigued and ask him to elaborate, what is a “Sunday player”? What makes someone a “Sunday player”? He laughed for a minute and went on to explain to me, how he qualifies someone as a “Sunday player”. So it seems that someone who practices all week and come Sunday they play their hearts out for their club, putting on amazing performances and being glorified as the best that there is. Once they put on the national team jersey at a major tournament, they become an average player, perhaps even below average. I thought, how intelligent that is, the perfect way to describe players like Rooney, Hulk, Lukaku and many others. 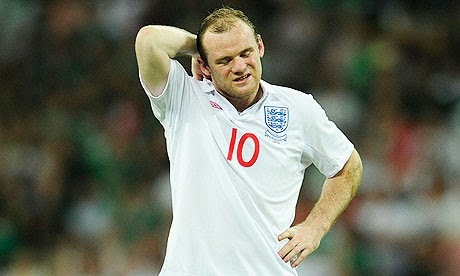 Rooney was the first player that came to mind. A huge star at Manchester United, but in his career has only one World Cup goal and that was only reached this year in Brazil. He is without a doubt a “Sunday player”, he hasn’t been able at the big tournaments to put on performances the same way he does week in and week out for Manchester United. I don’t have an explanation on why some players just don’t show up for the big games at the big tournaments. I just can’t explain it, it seems so strange, since they play big games for their club all the time, but when it is the national team jersey it seems to carry more weight. Instead of trying to explain it I will just embrace this new expression that I have learned and I will start to use it for some of the players that we are watching in Brazil this summer. There is No Biting in Football, or is there? 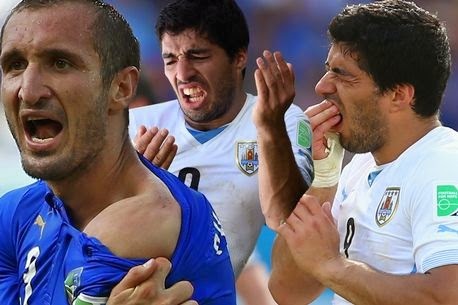 I could say that I was surprised when I saw Suarez biting Chiellini during the Italy vs. Uruguay game on Tuesday, but I wasn’t. After all, he has a history of biting his way into open space when inside the box. We all laugh and shake our heads when we see it, and sit in front of our computers waiting for a Suarez meme to pop up on some obscure website, but the truth of the matter is that this behavior is completely unacceptable and it is starting to borderline an illness. For parents at home watching the World Cup with their young kids how do you explain what Suarez did? 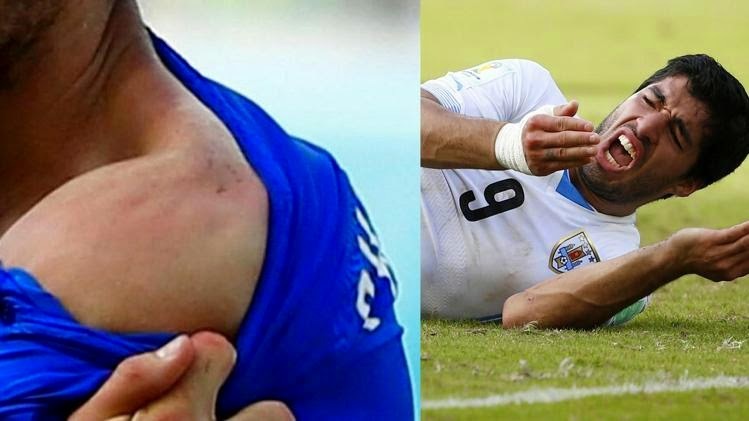 We all tell our young children not to bite, that it is not the right way to deal with a problem or someone, and now here it is, this professional player, playing in a World Cup biting his opponent. Biting is one of the most primitive things a person can do, this is why children do it, but Suarez while he needs braces he isn’t a child anymore, therefore he should stop behaving as one. I am not a doctor, but I think this is becoming a chronic problem with him. The way he tries to shake off a defender is by biting him? In what football academy do they teach that? I think the same way Liverpool was quick to forgive his bite and racism incident so are we. We look at him and say “but he is an amazing player”, that should be irrelevant. It doesn’t matter how good someone is, when they do something like this they should be punished for, after all there are millions of children watching at home. Like the Wu Tang Clan would say, “Do it for the children”. We need to set aside how good he is at what he does and judge him on his actions and ensure he is punished for them. Let’s face it, he has done it before and he will do it again, and as long as people in positions of power at his club and national team look the other way, because of how good he is, he will continue to do it. All we are teaching our kids are that if you are really good at something, you can get away with whatever you want, even if you are a “Sunday player”.